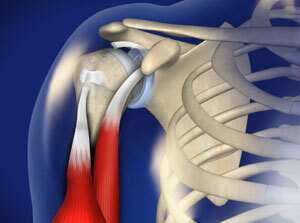 This condition is a tear of one of the tendons that anchor the biceps muscle to the shoulder. The upper end of the biceps muscle is divided into two separate sections called the long head and the short head. The long head passes over the head of the humerus and attaches to the glenoid. The short head passes in front of the humerus and attaches to a bony protrusion, called the coracoid, on the shoulder blade. The part of the biceps that enters the shoulder joint can become inflammed from tendinitis, tear partially, shift out of its position, or rupture completely. A complete rupture of the biceps at the top of the shoulder can cause a cosmetic deformity of the upper arm called “a popeye muscle.” This occurs as the biceps muscle falls from above and bunches up closer to the elbow. Other symptoms include: pain, a pop, cramping, bruising, swelling, and weakness. Non-surgical treatment includes: Protection, rest, ice, and nonsteroidal anti-inflammatory medication. Non-surgical treatment may be selected in older patients who haven’t injured their rotator cuff, and who aren’t bothered by mild weakness or the popeye deformity, and in those whose pain resolves. Surgical treatment may be recommended for younger and active patients who require strength for work or athletics. Surgery may also be offered for those individuals who fail to respond to conservative treatment measures. The surgery involves reattaching the tendon to bone. It is usually performed in an outpatient surgery center.